Erich Ferrari frequently tries cases before the U.S. federal government and federal courts. From his sanctions law practice perched on Pennsylvania Avenue in Washington, D.C., Erich Ferrari (J.D. ’06) is always upfront with his clients, even if he knows they won’t always be happy with what he has to say. This has lost him clients before, but Ferrari doesn’t want to give unrealistic expectations. Ferrari has been a sanctions lawyer for almost 12 years. He has represented U.S. and foreign corporations, financial institutions, exporters, insurers and private individuals in trade compliance, regulatory licensing matters, and federal investigations and prosecutions. Typically, clients fall into one of three areas: they are on a sanctions list; need representation after dealing with embargoed countries like Iran, Cuba or Syria; or want help navigating a policy. These cases are frequently heard before the U.S. Department of the Treasury’s Office of Foreign Assets Control, the U.S. Department of Commerce’s Bureau of Industry and Security, and in federal courts throughout the country. About 80 percent of Ferrari’s work requires him to travel outside the U.S., so he is abroad nearly every week to places such as Colombia, Mexico, the United Kingdom, Germany, Myanmar and Lebanon. 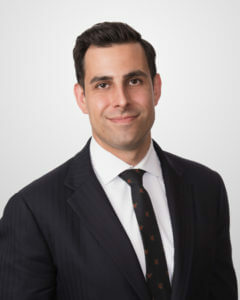 At the St. Mary’s University School of Law, Ferrari said he had the freedom to explore the topics he was interested in, namely national security law. After graduation, Ferrari moved to Washington D.C., where he felt he had the best chance of practicing it. Instead, he ran into a lawyer from Texas who hired him to do sanctions work. Then, in 2009, Ferrari took a leap of faith.